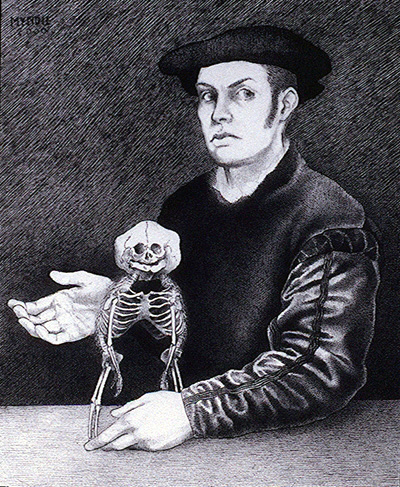 Here I cast myself in the role of Renaissance scholar/physician, posed with an attribute of my trade. In this case, the specimen is the skeletal remains of a conjoined fetus of the variety cephalothoracopagus — a situation in which the skull and ribcage of two children have fused into one, as if they were dancing really close. There is an exceptionally lovely example of this peculiar monstrosity housed in the collection of the Mütter Museum in Philadelphia.